When I saw swordfish on sale at the market, I knew what we were going to have for dinner. I love swordfish, but it is often hard to get it fresh (frozen means it will be dry) and for a reasonable price. 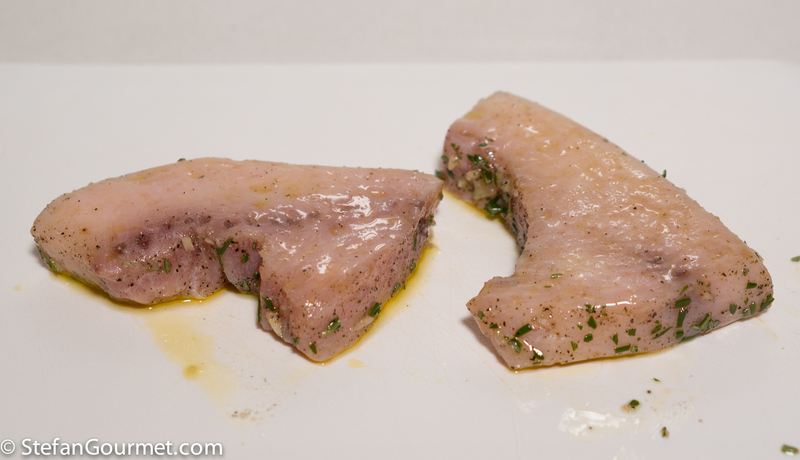 Swordfish is very meaty with a mild fish flavor. I served with ratatouille and brown rice for a tasty and wholesome meal. 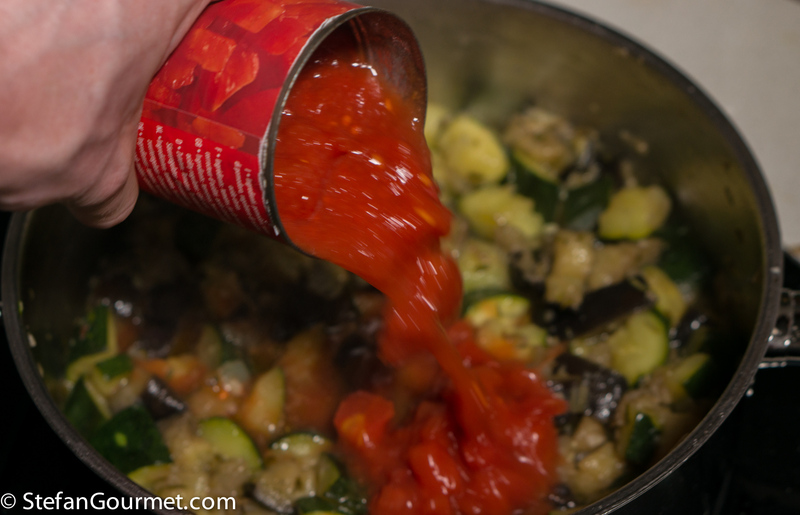 Ratatouille is a vegetable dish from the Provence (south of France) with eggplant, zucchini, tomatoes, onion, garlic, rosemary or thyme, and sometimes bell peppers (which I omitted this time around). When preparing swordfish, it is very important not to overcook it. The difference between tender and juicy swordfish and tough and dry swordfish is just a minute of overcooking. To work around this problem, you can cook the swordfish sous-vide and then only very briefly finish it on a very hot griddle, like I did. If you skip the sous-vide step, an instant read thermometer with a probe would be helpful. 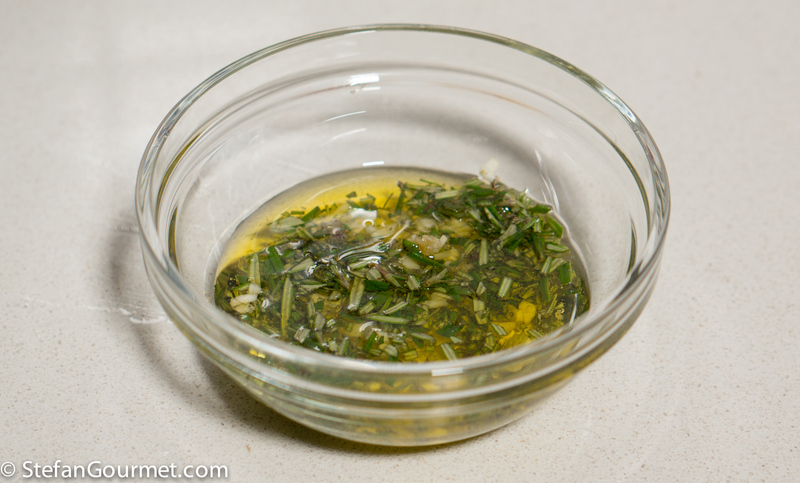 In a small bowl, combine 1 tablespoon of minced rosemary with a minced garlic clove and 2 tablespoons of olive oil. Season the swordfish with salt and freshly ground black pepper on all sides. Then rub with the rosemary mixture. 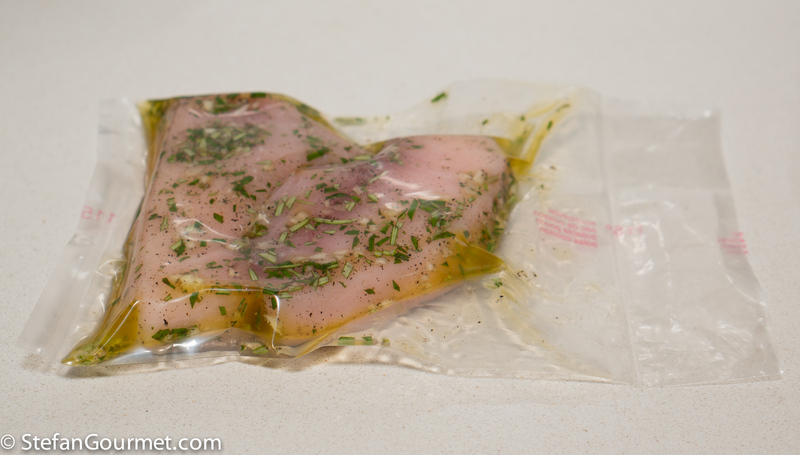 If cooking sous-vide, vacuum seal. Allow the swordfish to marinade for at least 30 minutes or up to several hours in the refrigerator. 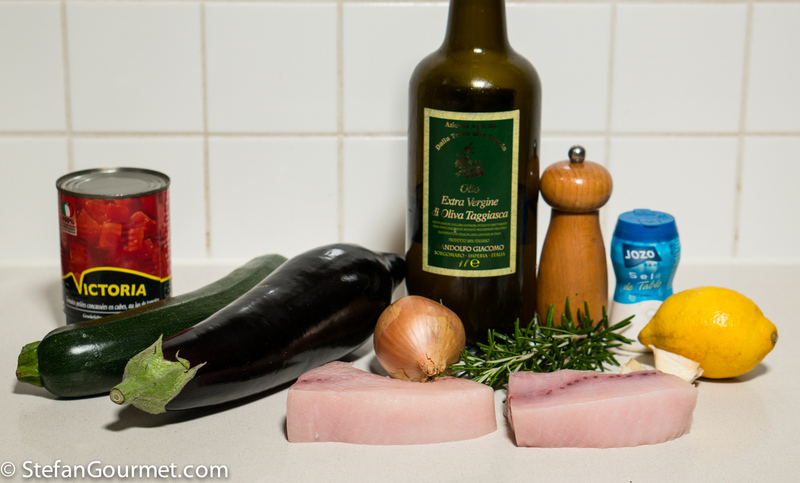 While the swordfish is marinating, make the ratatouille. 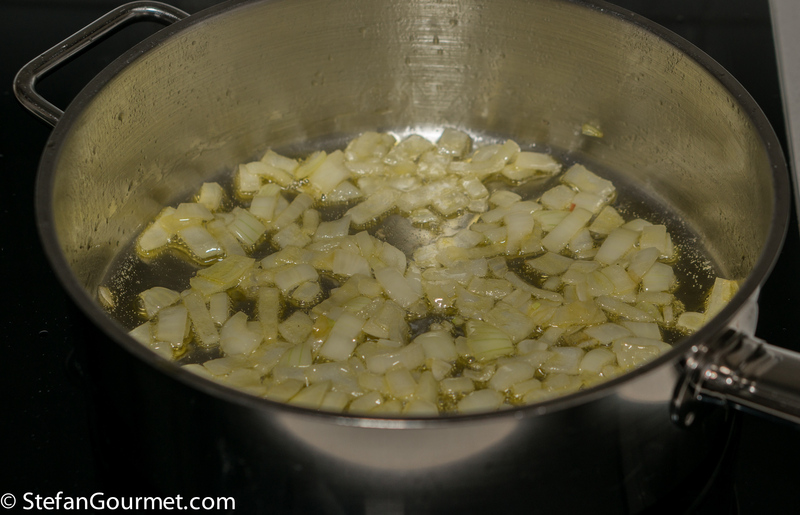 Heat 3 tablespoons of olive oil in a frying pan or casserole and add a chopped onion. Season with salt. Stir over medium heat until the onion starts to turn golden. 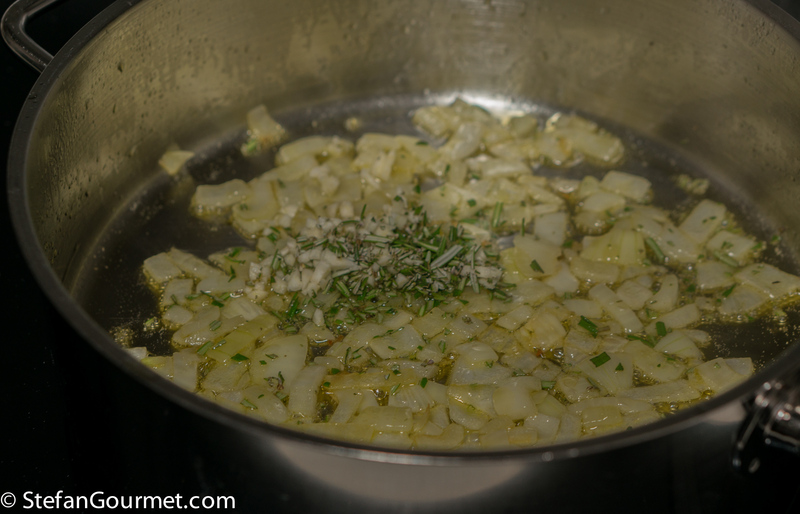 Add the remaining minced clove of garlic and tablespoon of minced rosemary. Stir briefly over medium heat, but do not let the garlic turn brown. Add an eggplant cut into pieces and season with salt. To do this, cut off both ends, cut the eggplant in quarters lengthwise, and then cut each quarter into slices. 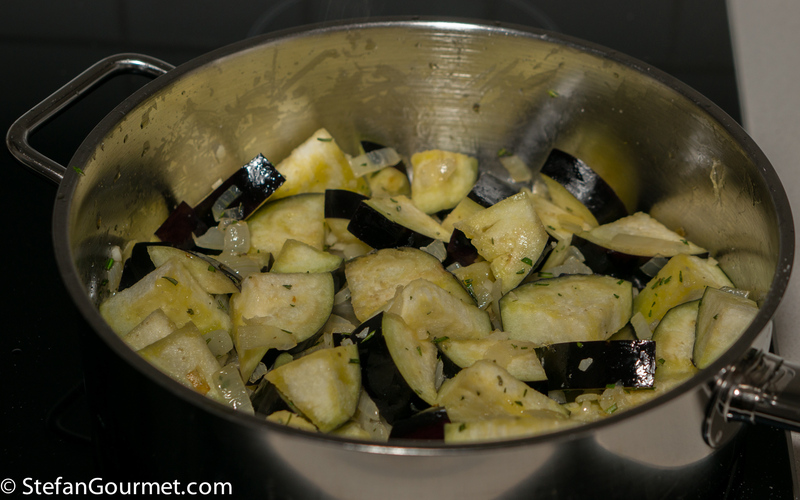 Stir for a couple of minutes until the eggplant is covered with the oil. Cover the pan while you prepare the zucchini. 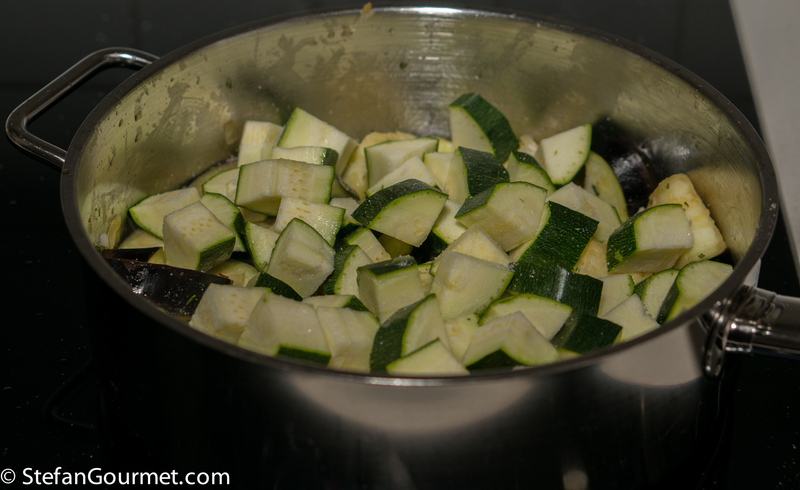 Cut both ends off the zucchini, cut it in quarters lengthwise, and cut the quarters into slices. 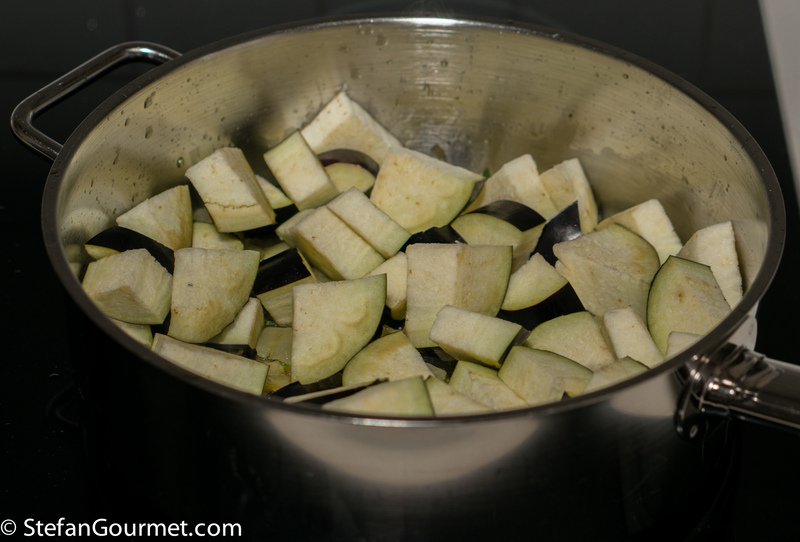 Just like the eggplant, this will ensure that each piece of zucchini has a bit of skin. 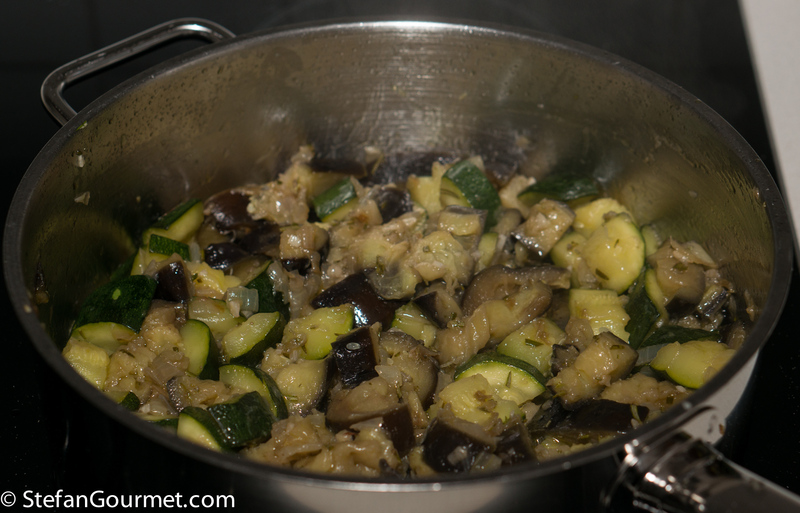 Add the zucchini to the eggplant. Stir and cover. Cook over medium heat, covered, stirring regularly, for about 15 minutes. 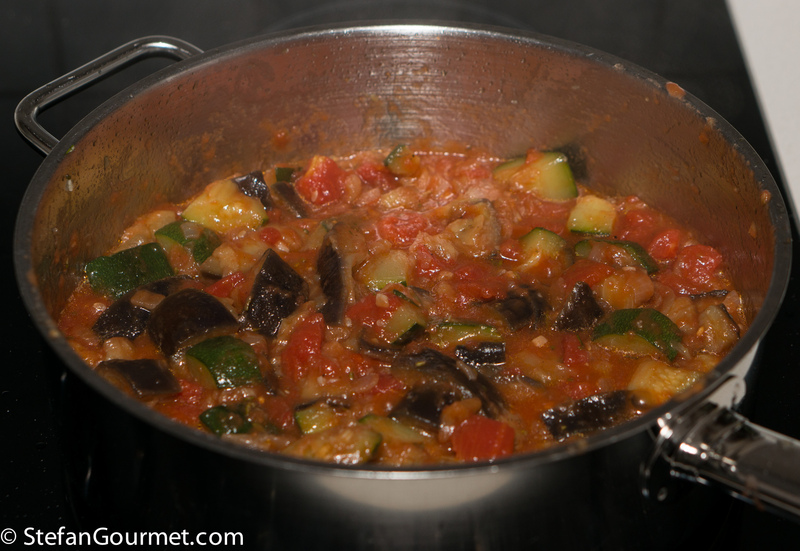 When the eggplant and zucchini are almost cooked through, add 400 grams of chopped tomatoes. Season with salt and freshly ground black pepper. Stir and bring to a boil, then lower the heat to a simmer. 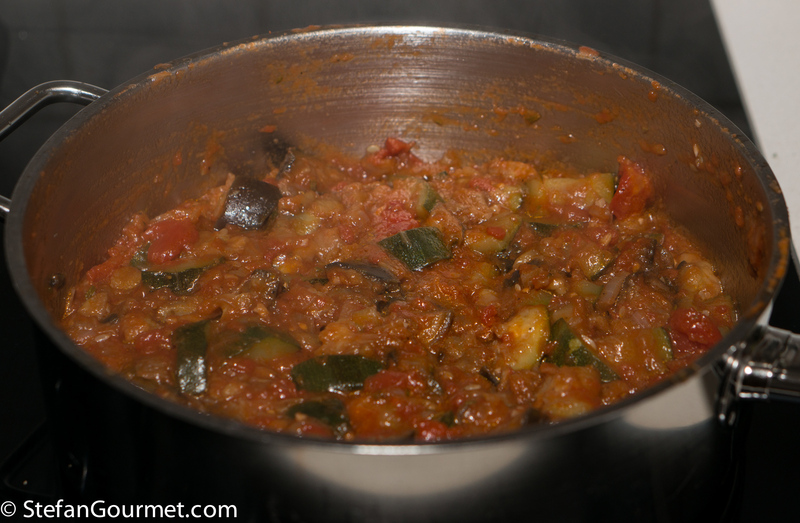 Simmer the ratatouille until the tomatoes have thickened, about 20 minutes, stirring regularly so it doesn’t stick to the bottom of the pan. 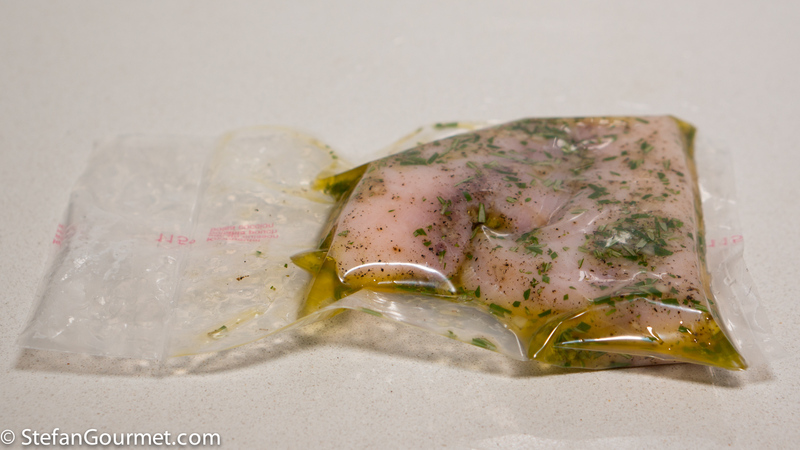 After cooking sous-vide, take the sworfish out of the bag and scrape away the rosemary and garlic from the top and bottom side. (If you don’t do that, the garlic and rosemary will burn on the grill.) Rub both sides lightly with olive oil. 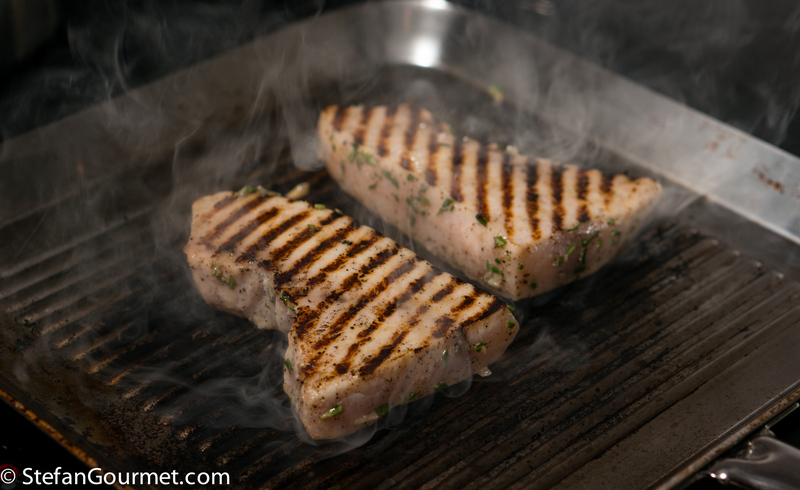 If the swordfish has been cooked sous-vide, sear it on a very hot griddle for about 30 seconds or until it has nice grill marks. 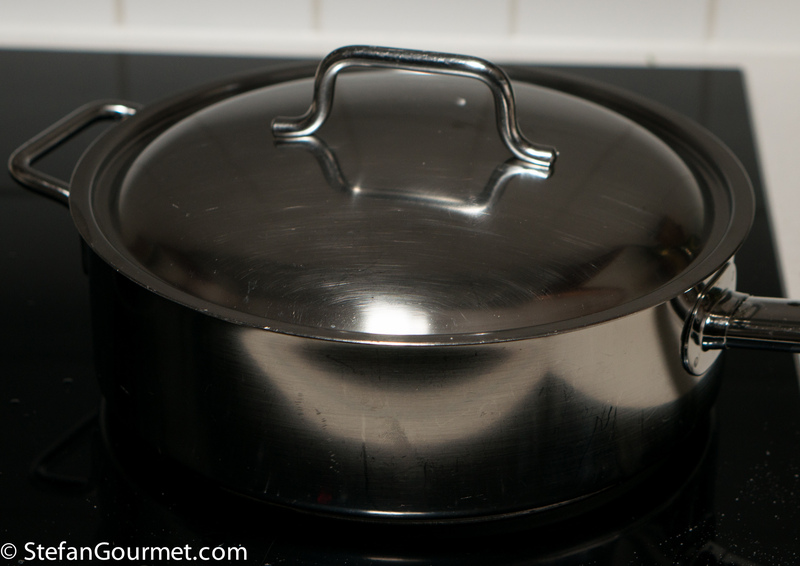 If it has not been cooked sous-vide, cook it on a hot griddle (but not very hot) for 2 to 3 minutes. The heat should be such that after those 2 to 3 minutes there are nice grill marks. Turn the swordfish and cook the same way on the other side. 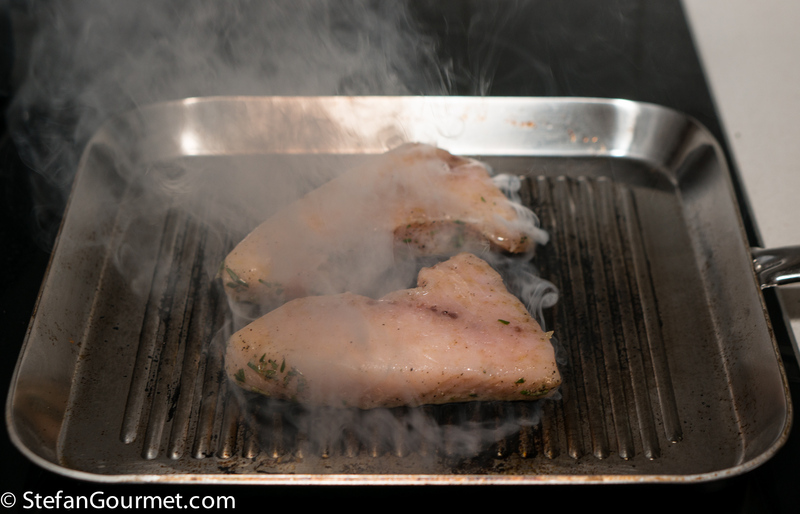 With sous-vide it is easy, if cooking from raw it is best to cook until an instant read thermometer with the probe inserted in the center of one of the swordfish steaks indicates a core temperature of 50C/122F. 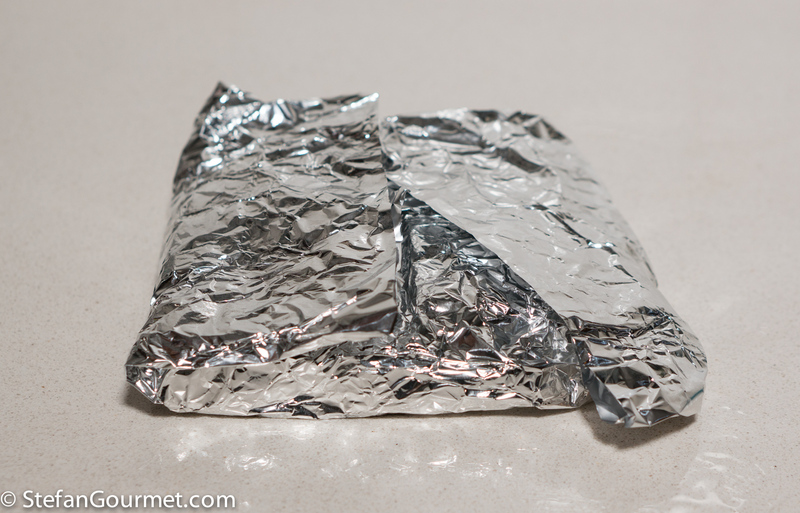 Wrap the swordfish in aluminum foil and allow it to rest while you prepare the plates. Serve the swordfish with rice (or roasted potatoes), the ratatouille, and a lemon wedge. Because the swordfish is so meaty, it can handle a full-bodied white. 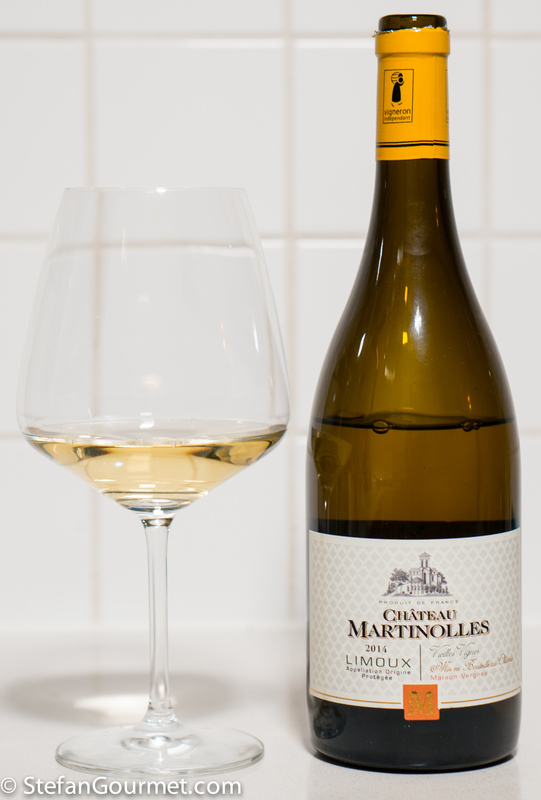 The grill marks work very well with a wine that has been aged in oak, like this Chardonnay from Limoux. 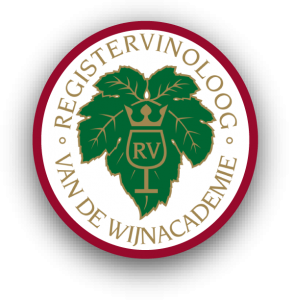 This wine has a great balance with good acidity that works well with the lemon juice as well. A good white Burgundy, which is very similar to this Limoux but more expensive, would also be a great choice. I will try this soon beca use I also love swordfish. However, I would be interested in fewer sous video preparations. It’s not just that I don’t have a sous video machine, but I also admire Stefan’s skills and would like to follow his lead more often. 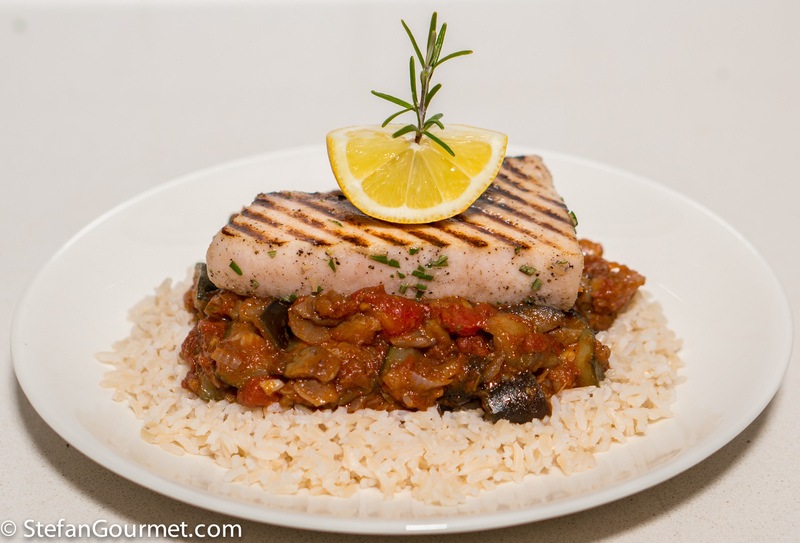 I serve swordfish and ratatouille together too, a great combination. Stefan there seems to be an error with most of your preparation photos. WP know there should be an image in the space but it’s not sourcing them. PS Reading Sandra’s above, I am getting all the photos she is missing, and from Australia – BUT: I had to repeat a comment twice from AU>US this morning with no mistake made . . . what does cursing WordPress achieve 🙂 ?